On the 14th May we got our first win of the year. Very well deserved too. We started very well getting a goal and 3 points before Carrig got two quick goals before half time. The second half was all the Midleton girls rattling off 4 fast points and building on that lead. It finished 4-9 to 3-2 and will give the girls great confidence for our next two games against Cobh and Youghal. On Monday last our U8's had their first outing of the season with a home game v Watergrasshill. The girls turned out in great numbers so we were able to divide them into 2 teams. On pitch 1 the older girls played a brilliant game. Their ball passing, kicking and overall play proved to be too strong for Watergrasshill. One pitch 2 our younger girls put up another great performance. For some of these girls it was their first time ever playing a match. They made a great effort putting the skills they have learned in the last few weeks on display. Well done to all who played on the night. Next up is Fermoy at home. 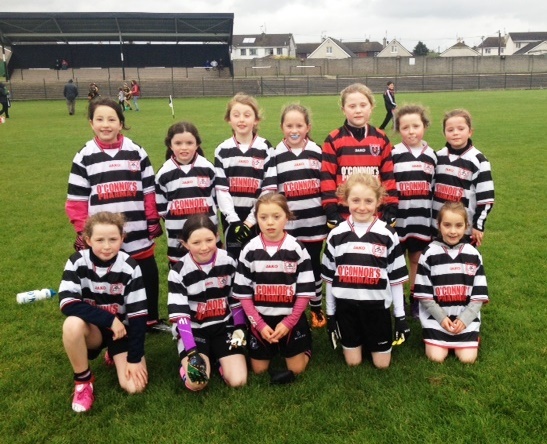 Last Sunday saw the unbeaten U10's take to the main pitch in Midleton GAA to take on Fermoy. A great display of football skills from both teams kept the supporting crowd entertained. Unfortunately for Midleton they came up short by just 1 point. Onwards and upwards girls. Keep up the good work ye are putting in at training. Reminder for all girls that membership is now due. Please ensure all money due is paid to ensure selection for matches.